Let’s take a look at our projected ACC regular season champions, the North Carolina Tar Heels. The Good: There’s no two ways about it. Whether you’re a North Carolina fan or a Duke fan or an anybody else fan, you must admit that North Carolina is an offensive juggernaut this season. The numbers don’t lie- first in the country in scoring at 88.1 points per game, first in the country in rebounding at 47.1 per game, second in assists with 19.7 per game. These numbers are absolutely absurd. The Tar Heels have scored less than 80 points in a game on just three occasions this season. They outrebound their opponents by 11.8 boards per game. North Carolina has gone at least nine deep in every game this season, and 15 players on their roster have played at least 11 games. This team has dominated the paint this year thanks to the play of John Henson and Tyler Zeller. Kendall Marshall is very difficult to stop in transition, dishing out 10 assists per game. Love them or hate them (and believe me, I hate them with a burning passion) this team is pretty damn talented. The Bad: You can put this team on the line as much as you want and have little consequence. North Carolina is shooting a lackluster 64.0% from the foul line this season. In fact, only four players on the entire North Carolina roster are shooting above 70% from the free throw line on the year. This is a glaring weakness for a team with such an efficient offense. In the Tar Heels’ loss to UNLV, they shot just 20-for-33 from the line. Their woes from the line could certainly come back to haunt them if they get caught up in some tight games during their conference schedule. The question is, on how many occasions is their poor free throw shooting really going to matter? If they continue to build up 20 or 30 point leads on teams, not too much. The Crazie: This team is almost perfectly put together, with five seniors, three juniors, three sophomores, and five freshmen on North Carolina’s roster. This provides them with the perfect blend of experience and youth. Their tournament experience is fairly extensive as well. North Carolina’s seniors were a part of their last national championship team during their freshman year, and all players excluding the freshman made a run to the Elite 8 last season. It’s hard to think that just two years ago the Tar Heels went 20-17 on the year, finishing 10th in the ACC with a 5-11 conference record, and missed the NCAA tournament for the first time under Roy Williams. Player We Love To Hate: Well considering they play basketball for Roy Williams, wear that ugly shade of blue, and call Chapel Hill, North Carolina their home, we love to hate every single player on that team. But if I had to pick, I couldn’t narrow it down to fewer than three players we love to hate the most. 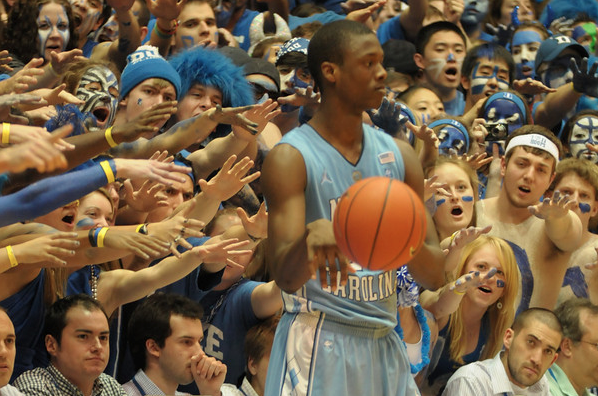 You have to start with sophomore Harrison Barnes. Not only is he the most talented player on the team and therefore the biggest target (see Redick, J.J.), but he also chose North Carolina over Duke after the consensus was that Duke had Barnes all but wrapped up. If going to the University of North Carolina doesn’t make you a big enough villan at Duke, that’s a good way to up your street cred. We also love to hate John Henson, who averages 15 points, 10 rebounds, and three blocks per game and is one of the most efficient big men in the country. He’s given us fits on defense in the past, and is one of those “you hate him because you can’t stop him” players. 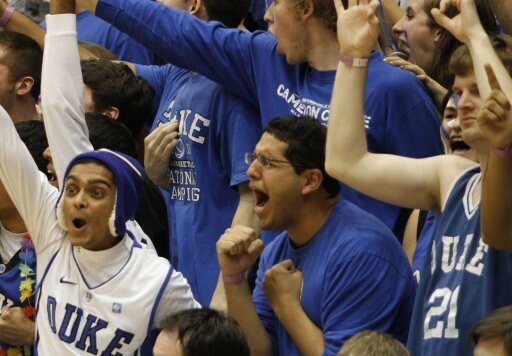 Luckily for us, Henson’s younger sister Amber made the right choice and is playing basketball at Duke. And we can’t talk about hating on North Carolina without mentioning Kendall Marshall. You may also know him as @KButter5, or as we like to call him, the most ridiculously obnoxious guy in the entire Twitterverse. Though his tweets do often provide a fair amount of comedy, ranging from the fairly ridiculous to the…fairly more ridiculous. Not to mention he’s also a fantastic point guard, and Duke has had some pretty big problems with North Carolina point guards in the past (see Lawson, Ty). Oh and honorable mention for Tyler Zeller, whose brother Cody at Indiana is simply better at basketball than he is. What you mean you didn’t expect the “Player We Love To Hate” section to be the longest section of the UNC post? The Bottom Line: This is a very complete basketball team with only one glaring weakness. It shouldn’t lose more than a couple games in the ACC regular season, and will more than likely split its matchups with Duke like it has in years past. They more than likely won’t win the ACC tournament, because typically Roy Williams doesn’t seem to care too much about that. Though I don’t think they’ll win it all, this very easily could be a Final Four year for these guys. Biased or not, anyone that says North Carolina isn’t the best team in the ACC is kidding themselves. Tonight is an opportunity. Duke can break a tie with Maryland for first place in the ACC and potentially grab the number 1 seed in the conference tournament. Jon Scheyer, Lance Thomas and Brian Zoubek can cap off their home careers with a victory. Coach K can move closer to 900 wins. Etc. There are a million reasons why a win tonight is important for tangible and statistical reasons. But then there’s that creeping feeling, the weird tingle you get under your skin when the pale blue boys come out on Coach K Court. North Carolina has had our number for four years in Cameron. Last year, two of our most hated Tar Heels had their day: Ty Lawson sliced through our defense and Hansbrough completed the career sweep of Duke at Cameron. Regardless of Carolina’s record (16-14, 5-10 ACC, by the way) this game is outside of trends, ignorant of statistics. The bad guys will have swagger tonight, and they deserve to. It’s up to us to beat it out of them and leave them deflated and CBI-bound. This game is personal for everyone involved. Last night Coach K urged the residents of K-Ville to bring two emotions to the game tonight: anger and fury. I, for one, will have no problem with that. With a few Red Bulls in me tonight, I can’t wait to scream all game, and hopefully burn benches all night. Let’s do this for the seniors. Let’s win it and send Roy’s Boys back to Chapel Hill to hole up in their apartments. As Coach K said last night, we are all a family—the team, the coaches, the students, the University. Tonight we can remind the nation whose house this is.